You may know fun. simply as the band that sings “We Are Young” or maybe you know them as the band that had 3 songs in the Billboard Top 100 in 2012 and who had their second full album, Some Nights, recently go platinum, but this band has much more humble beginnings than this. fun. was formed in February 2008 after Nate Ruess’s former band The Format split. Fun. was formed when Ruess brought in Andrew Dost and Jack Antonoff from Anathallo and Steel Train, and they released their first album, Aim and Ignite, in August 25, 2009. This album took off in the alternative music scene getting recognition as a progressive and amazingly written pop album. The next year, fun. set off on their first North American tour with the band Jack’s Mannequin. Two years later and the song “We Are Young” started changing this band’s life. On March 7, 2012, Fun’s single “We Are Young” reached the No. 1 spot on the Billboard Hot 100 chart and their sophomore album, Some Nights, took off from there and they have been continuously touring since. Now, fun.’s back on tour and this time they brought out Andrew McMahon (ex-Jack’s Mannequin and Something Corporate), and I must say; this was a show to remember. Andrew McMahon opened the show with a mix of classic Something Corporate songs along with his soulful Jack’s Mannequin tunes. Though not many people in the crowd seemed to know many of McMahon’s songs due to the fact that he was added to the tour after it was sold out, he seemed to capture the attention of many prospective fans. As McMahon’s first solo tour the few fans in the crowd were greatly anticipating what was to come about, and I must say, as a fan myself, I was thoroughly impressed. With everything from “Dark Blue” to “I Woke Up In A Car” we were able to hear Andrew McMahon’s journey over the last 10 years. It was simply amazing to be able to see McMahon perform live for the first time as a solo artist and be able to see his growth all in one performance. Next, it was fun’s turn to play to the full house at The Orpheum. They opened with “Out On the Town”, a bonus track from Some Nights and you could feel the excitement of the crowd completely radiate throughout the room. Dedicated fans of fun. screamed the lyrics along with Ruess and as the set progressed, you could feel the amazement and astonishment of the crowd grow as more and more well known songs were performed. “Some Nights” and “We Are Young” got screaming whoops and a rowdy singalong from every head in that crowd, while the lyrics to songs such as “Barlights” and “The Gambler” flowed out of devoted fans alike. Fun. put on a show that was thoroughly impassioned and impressive to new and old fans alike. Their like show all in all proved why this band has taken off so well in the last year. 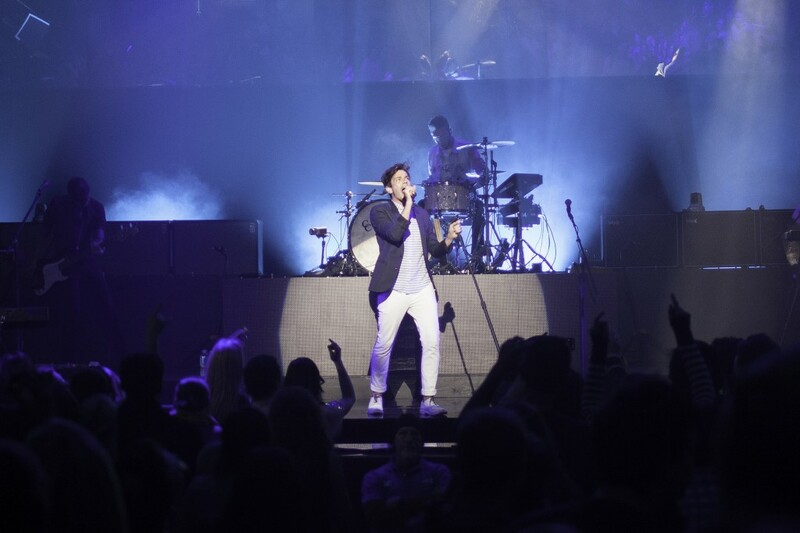 Everything from Ruess’s extraordinary stage presence to Jack Antoff’s staggering guitar solos to Andrew Dost playing everything from piano to stealing Ruess’s famous gold microphone, it was a show to remember. And the Boston Celtics jerseys weren’t a bad touch either.